Visiting the United Kingdom (UK) and in particular Wales, England, or Scotland for a holiday? Like to spend a day(s) in the mountains, surrounded by beautiful alpine scenery? Like a challenge? Have some experience walking in alpine terrains, scrambling over rocks and the ability to navigate? ....then look no further! 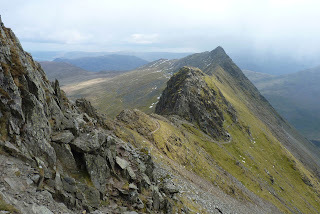 I've just come back from climbing three of the most popular mountains in the United Kingdom (UK) in one of the wettest months (April) on record. These are not huge mountains (950 - 1350m) and on a good day, can be tackled as day walks of 5-8 hours from the nearest car park, following footpads and tracks, but the difficulties should not be underestimated, and it is for good reasons that all of these walks are recommended for experienced walkers. The level of difficulty is highly weather dependent; on a sunny, clear day, the challenge is mainly fitness, but on a cold, windy, and foggy day with a thick layer of snow over the track, ice on the rocks and rain, sleet or snow falling, the challenges can be life threatening. I had the misfortune to experience all of these on each of my walks: Mt Snowdon 1085m (Snowdonia, Wales), Mt Helvellyn, 949m, (Lake District, England) and Ben Nevis,1343m, (Fort William, Scotland). As with all walking in mountainous terrain, you need to go prepared for all weathers; sun glasses for bright sunny times, beanie and gloves for cold days, waterproof jacket and over pants for wet times, map, compass and GPS for foggy weather, poles for snow covered slopes and down jacket and bivy bag in case you have to spend the night out. Forget just one of these and you could be in real trouble. Normally April /May in the UK would be spring days with just a cap of snow above 700m, but there is no such thing as a normal day in the mountains. I found that strong winds, snow, hail and rain tested my preparedness and fortunately did not show me lacking. 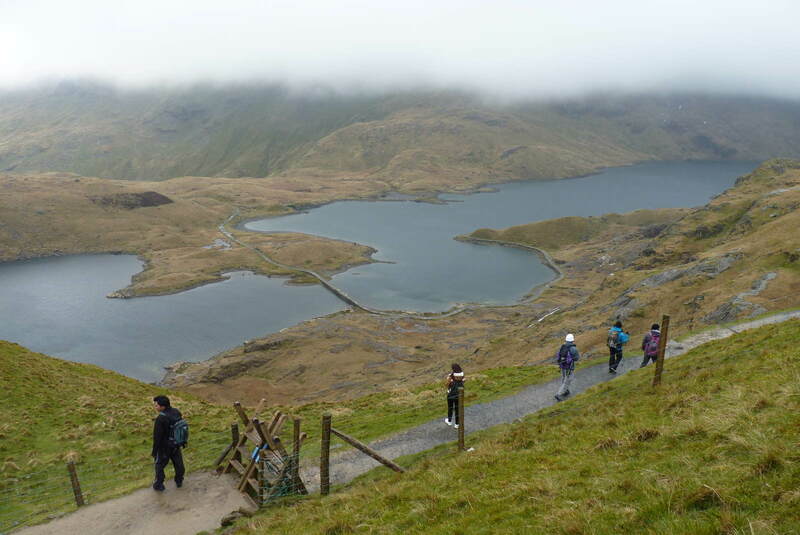 Only the week before I arrived, a lone walker had slid off Mt Snowdon, one of the most popular walks in Wales. I could understand how this could happen, as while the terrain is not difficult on a fine day, in adverse weather, the challenges are enormous. The key to survival in adverse weather is to make a risk assessment early in the walk and decide whether to turn back or take a lower route before you have committed yourself. On Mt Snowdon, 1085m, I decided to turn back, probably too late, after having completed most of Crib Goch, the most difficult part. This was a difficult decision, as I knew the easy part was not much further on and if only the fog would clear I would be able to see my route. The fog never cleared and my route became deeper and deeper in snow as I progressed. I contemplated dropping off the ridge to find the lower track, but remembered that this was not advised and a trial descent for a fifty metres only reinforced this. Too slippery, too steep and plunging into the unknown. Apparently many of those dying on the mountain are actually quite experienced technically but make poor decisions about when to turn back. I was glad I did not become one of those statistics. Mt Helvellyn, 949m, along with Striding Ridge, in the lake district of England was my second walk a few days later and I could not believe that it was not long before I was again walking in snow, hail and fog. Fortunately the terrain was less demanding and I did not feel the need to turn back. Every so often, a break in the clouds would show the route and the twenty or so walkers I could see ahead and behind, and I was reassured. I was glad I had my walking poles with me, as the snow covered rocks were quite slippery and a fall was quite possible. I knew that the way back along Swirral Edge, was not too difficult when I had lunch with a mountain biker at the top. I can only suppose he carried his bike for much of the way as he was quite exhausted. Ben Nevis, 1343m, ( The Ben to locals) is the highest mountain in the UK and as such, subject to some of the worst weather. Locals joke that you can expect all four seasons in any one day, and even a blizzard thrown in for good luck. So bad is the weather usually, that the last few hundred metres has cairns every 50 m, so those walking in fog don't fall off the side. Of course this only works if you can see the next cairn, or follow the track which I couldn't, due to deep snow and fog. Fortunately the map has a compass bearings to follow in white-out, and while helpful, success depends on being able to estimate distances in fog, a tricky skill at the best of times. I was quite nervous as I approached the top! I came back to Australia with a deep respect for these "lowly" mountains which have tested many a walker in the past and found too many of them lacking.